What if you could infuse your marriage with Holiness, finally having the calm, support, connection, and harmony that you’ve so yearned for with Christian marriage counseling and relationship therapy honoring bible scripture? You love God, but maybe right now you just aren’t feeling the same way about your spouse. We offer Christian couples therapy in Baltimore, MD; NYC, NY; and Jersey City, NJ and have had amazing results with couples across the country using imago relationship therapy. Call (443) 570-7598 to schedule therapy or to learn more about our experience and counseling services. Here’s what may not seem so obvious: It is through the marital relationship itself that we can better understand what it means to be in relationship with God. We are commanded to love God, yet it is through human love that we are able to even begin to fathom what love is. One can better understand what it means to be humble before God and to go beyond our ego by practicing these virtues in our own committed relationship. If you’re religious or hold traditional values and are looking to know how to blend your values along with marriage counseling, you’ll appreciate our approach. We’re Orthodox Jews but our message is non-denominational. If you’re looking for marriage counseling for Christians, or bible-based marriage therapy, you can feel safe in our office. If you would like to be able to trust that your marriage counselor does not have an agenda of his/her own, will not take sides, and will support your traditional views about family, keep reading! What does the Bible have to say about Marriage? The ideal we strive for is to walk in the Lord’s ways. When we act with mercy, grace and compassion in our relationship with all of Creation, we spread God’s blessing in the world. There is no greater human relationship that provides us this opportunity to be holy than that of a husband and wife. Ancient Jewish tradition explains that husband and wife are really one soul that was divided in half—half of it in a male body and its other half in a female body. Finding our destined partner enables us to find our lost half and return to our original Wholeness. This is why marriage is accompanied by an unparalleled amount of joy. God has brought the couple together and the His divine plan has become manifest! In our increasingly confusing world, wholesome family values and the idea of marriage as a commitment ‘Til death do us part’ are often scorned. If you are seeking traditional Christian marriage counseling, make sure the program based on sources with similar values about marriage, or is at least respectful enough of where you are coming from. You don’t want to go to marriage counseling to save your relationship and wind up being encouraged to get divorced! Our marriage retreat, while not specifically religious, will provide you the encouragement and hope that you need to restore your marriage as well as practical tools that will get you there in a safe way that is in line with your religious values. 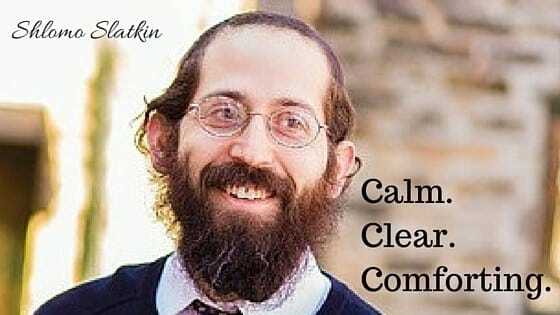 My name is Rabbi Shlomo Slatkin and I am a Licensed Clinical Professional Counselor and a Certified Imago Relationships Therapist (Advanced Clinician). Over the past decade my work has saved countless marriages and has been featured on news sources such as The Huffington Post and Fox. I’ve put together a tried and true formula for you so that that you can feel optimistic and hopeful again about enjoying a marriage that is respectful, supportive, and healthy. It would be a privilege to work with you and support you in effectively bringing back clarity and love into your relationship. The Marriage Restoration Retreat is two full days of Imago Therapy, plus 8 followup sessions in person or on Skype, where you will see how Imago theory applies to your unique situation, including why you chose each other, why you are now experiencing conflict, and how the Imago dialogue and other processes can provide you with healthy, supportive tools to unburden your relationship- calmly and comfortably to achieve maximum growth and healing. Let us share the excitement that we have for Imago Therapy and help you transform your marriage today! What Dr. Harville Hendrix, Founder of Imago Relationship Therapy, has to say about Rabbi Shlomo Slatkin, MS, LCPC, Imago Relationship Therapist Advanced Clinician. We’d be separated right now if not for Rabbi Shlomo Slatkin. Ten years of marriage, 3 kids under 6, and ongoing arguments about the same issues brought us to a fork in the road. We had a breaking point that started the divorce process. After a week of separation, we agreed to seek counseling. We found a praised relationship counselor, but our meetings with him led to increased resentment, new ways to hate each other, arguing, and the worst feeling either of us have ever had. Counseling failed miserably. I was seeing an independent therapist, who happened to be an Imago certified counselor, and he gave me the book “getting the love you want,” and the text resonated with both of us. After searching for retreats, we found Rabbi Slatkin. My wife was raised Catholic and I was raised without religion. Finding a new point of view was important to both of us. We wanted to truly listen to and seek guidance from a new influence. We live in Michigan and drove to Baltimore for the session. My wife and I found what we were looking for! We found each other in the deepest way possible. No arguments. No resentment. We felt like we started a second marriage or graduated from “marriage college”. We are eager to recommend the Imago process, and Rabbi Shlomo Slatkin, to any couple. Especially those seeking restoration of their marriage, a deeper connection, or couples who need to “find each other” again. By the time you finish reading this, another marriage will end in divorce. Good news, you can do something about it! Contact us to talk more about your situation.